In the 1970s, Carhartt sent a massive order of coveralls to workers building the Trans-Alaska Pipeline. These men's biberalls were designed using feedback we received from those workers. They have a durable CORDURA® fabric shell that fights off wind, abrasion, and light precipitation. The smooth quilted lining runs from the cuffs on up through the bib, and the insulation inside is the warmest we offer. It’s very warm. good quality, but very stiff.pants run long. Best overalls I could of used during the winter keeps you warm. Heavy duty. Warm. Outside material layer is a bit stiff but hopefully will soften up with use. The best I have had! Warmer and more comfortable than the other brands I’ve worn. Worth the money and will last me for years even though I will wear them everyday at work during most of the winter in Maine. These coveralls are very warm (I work outside year round - skilled trades) during the winter months. They are durable and have held up well so far. I've owned them for about two years. The only two things I dont enjoy - no open "pocket" to have access to your inside pant pockets, and the prong and hook style for the suspenders. They squeak/rub and dont always sit flat compared to the old style, button and hook I had before. I wear 32x30 pants but ordered these in a 36x30 to be able to wear pants and hoodies underneath and they fit very well. Perfect for those brutally cold days, paired with a thick hoodie or jacket and you’ll start sweating if you’re working too hard. Quality is immaculate and durability is off the charts. Will buy another once I run these into the dirt, but that’ll take a couple years at minimum. Only issue is that squatting or bending is tough but maybe after a few months they’ll break in a bit more. These are pretty nice.A little stiff and tight at first but have been told they will break In. I'm giving this product the benefit of the doubt in assigning an overall rating of 5 stars. In general, I'm happy with this product and consider it to be a quality garment with the exception of the snaps. I don't know how a company with your reputation and experience uses such cheap snaps as these. Many of them are hard to fasten and never really feel like they've snapped properly. There are some that you can't hear make a snapping noise when they mate. Others come undone in the first five minutes of wearing. After awhile, you just give up on keeping them snapped because it isn't worth it. The rest of the hardware is good quality. I don't understand how something like this happens--but I otherwise like the product. I use it on my tractor that has a snow thrower attached and they keep me warm. There's always a lot of snow being blown around in the wind, and these handle it great. Don't be scared to purchase this product, but I wouldn't expect much out of the snaps from my experience. I LOVE THEM. owned 4-5 pairs but these new style is crap.. the zipper i have to crouch down, unzip my leg and reach in to unzip .. why why why.. give us 1-4 more inches on the zipper on the crotch.. and the turn clips for the straps are just wrong now days.. every time i sit down 1 or both come undone and my straps are pulled all the way tight. im about to cut them off and do something different.. cant work with my bibs falling off..
We're sorry to hear these do not 100% meet your needs and have shared your input internally. Please contact us at 1 800 833 3118 if you need assistance. my son who is a Flagler for road work, he Told me they were great the best he ever had. Great product I have found them to be very comfortable and warm even at below zero temperatures. Snow doesn't stay on the fabric and it keeps me dry. It was pretty dang nice coverall. Warm thick. Durable. Although I thought the leg length was bit short. My crotch is smooshed up a bit. But not too bad. These bibs are awesome!! They fit right and you can tell right away they are made to last. They look great too! They are great and durable and are meant for "HARSH" conditions.....the only downside is they take time to break in....other than that they are top of the line product! If you live in the frozen state of North Dakota these are a need not a want, wouldn't go outside without them with the windchills we get here. We are sorry for any confusion. There is a unique size chart for each bib/overall; this one does not require you to upsize. Please contact us at 1 800 833 3118 if you need any assistance. Used the sizing guide and it’s a little too big, didn’t return it because paying to have it shipped back and waiting would be a hassle. I ordered a 44x32 had to change size to 40x30 run really big. Carhartt was very helpful and got replaced. Nice Quality. Really durable and warm. Repels water extremely good. Super satisfied. Best overall I bought hands down. We are sorry to hear this. Please note, the bib overalls are sized differently depending on the style; this one is true to size. Please contact us at 1 800 833 3118 if you need any assistance. The best pair of carhartts i have ever owned hands down the warmest things out there. I work outside, last week it was 7 degrees F with 30-40mph wind gusts, this kept me warm all day! GREAT ITEM!! Great product. Really durable and warm for working outdoors. These were purchased as a Christmas gift for my son, who usually wears the canvas bib overalls. Right now, he’s in the Yukon for Yukon Quest, an Iditarod type dog sled race. Temps are expected to dip to -21 this week, but they have experienced as low as -50 for the race. He will be handling dogs for a competitor, and says the bibs are THE BEST! Great product. Measure yourself before buying. Great bib. Love them for ice fishing. Keeps me warm and dry even in -20 windchill. Advertise to buy your regular pant size but had to go up 2 sizes as I have a larger guy. Otherwise great product. Very happy with my purchase. Love the higher sides as it helps keep the warmth in. Only rating 4 stars as I had to exchange for a different size. My wife bought me a pair years ago when we lived in Colorado . 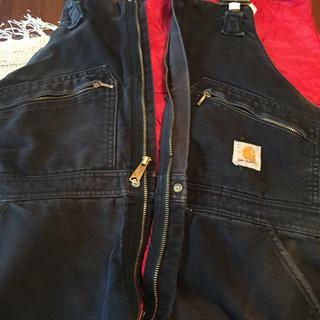 then we moved to NE Nevada where the winters were brutal...A few years back the main zipper broke but I wore them anyway , Now we live in NE Oregon , again very tough winters, so I tried to find someone to fix the zipper, finally contacted Carhartt to see about paying to have it repaired. I was floored when the very nice lady on the phone said, “ Let me send you a shipping label so we can fix it for you.” Life time warranty and Great customer service. I own so many Carhartt products and never knew. I will continue to be a customer for life. I purchased these bibaralls as a gift for my boyfriend. He works outdoors weekdays and he's been so impressed with the quality and warmth of this item. He also enjoys the mobility and how high the zippers on the legs can go. The only critique is that the clasps on the suspender straps are difficult to secure. Sizing was a little different than recommended. He wears 30×32 in Carhartt bottoms and the bibaralls that fit best were 34x31. He absolutely loves his bibaralls, would highly recommend. Seems well made, very warm, zippers need a little lubrication. These overalls were everything they were advertised to be. Virtually wind proof and warm with good flexibility. I would recommend this product to others. What size to get if you wear sweater and jeans? BEST ANSWER: You will go off your waist measurement. I wear a size larger than I wear in the Carhart cargo relaxed fit pants. The waist is true so wearing a sweater I needed a size larger. Plenty of room everywear else and not restrictive at all. You should stick close to your jean waist size. And you will have plenty of room for a sweater in bib section. 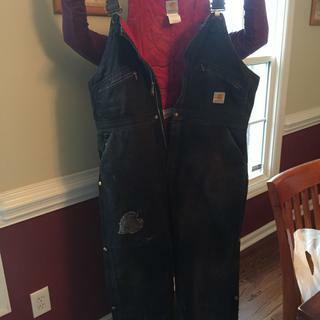 Normally I wear a 40 waist & 32 inseam what size should I get in overalls or coveralls insulated? BEST ANSWER: This style is true to size. What is the cold temperature rating? BEST ANSWER: We don't temperature-rate our garments, but this style features Arctic Quilt lining - the warmest we offer. Wondering if there's a women's style like this? if not I'll stick with the mens but I don't know what sizing I should go with in Mens. Since I have a waist of 30 with clothes on and inseam of 34. BEST ANSWER: We do not have a similar style in our women's line at this time. The smallest size we offer this in is 32, which is available with a 34 inseam. how do you bugle the bib ? I’m a female and the women sizes don’t seem too fit properly. I’m stuck in between men’s 28-30 waist & my in seam is 30. What size would be recommended? BEST ANSWER: Unfortunately, we do not offer a 28" or 30" waist in the R33. We would suggest the 32x30. Good evening. I just received a pair of extreme arctic bibs and found that the hand pockets are not zippered as stated in your advertisement. Can you explane? BEST ANSWER: We apologize for any inconvenience this may have caused. The website does say zippered hand pockets, this does reference the two chest pockets that are zippered. We understand the confusion and have sent this to the appropriate channel to have the wording corrected. BEST ANSWER: I don't know, and I hope I never have to find out! Do these come in a size smaller than 32? BEST ANSWER: A size 32 waist will be the smallest size we make. No. Actually mine fit a little snug. I bought them for cold weather motorcycle riding because none of the companies that make that stuff make it in my size, at least that I could find. These make it very difficult to lift my leg over the seat. Legs are a little long too. I have to close the snap at the bottom to keep from walking on the back of the leg. I can only speak to the size difference regarding the Biberalls. Mine seemed to be a size above what I ordered, I kept them, cinched the straps the whole way and I still have room for layering underneath. No, if you want to wear a sweatshirt underneath I would order 1 to 2 sizes up. Unless you like a snug fit. Do these have a hamme loop? This suit run relax fit or regular..? BEST ANSWER: We do not categorize our bib's in a fit. Would you recommend these for skiing or are they too loose around the boot? Basically I'm asking if snow would get up inside them if you fall over going downhill. I’ve not skied in them but walked in deep snow a lot. Snow did not get up inside the bibs but I’m not sure how they would do for you. Yes, snow would get inside them. I would not recommend for skiing. every online store i have checked anx the 32x28 are out of stock. are these still being made or are they just a popular size? BEST ANSWER: This style is not made in size 32x28. For a 28 inch inseam waist sizes will start at 34. For a 32 waist the inseam will start at 32 inches. 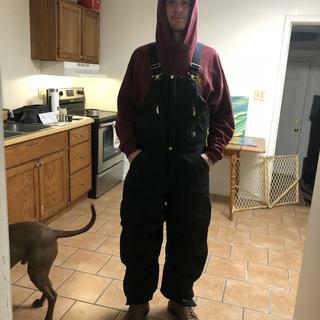 What is suggested to wear under the overalls thermal underwear?? BEST ANSWER: This style is sized with the assumption that you will be wearing regular pants and a shirt underneath. How hard are they to put on??? I completely agree with Lori W. Wear them an entire day right away to break them in. There a little stiff when I first got them, but other than that it's not that hard. not hard at all! 15 seconds and there on. Very easy, even with size 12 Muck Boots. My jeans are 38x30 but I measured around my stomach and it's 47 inches. What size should I buy? BEST ANSWER: We would recommend a size 48. I would go with 48x28. They'll be a little big but that leaves room to wear bulky shirts like sweatshirts. My inseam is also 30 and I bought these with a 28 inseam and they are plenty long. They still bunch up some at my boots. 48 waist is what I would go with. The suspenders will keep them up. You want to work comfortable. I have a similar issue, I'd go with the 47"
What is the in seam? BEST ANSWER: The inseam is the length in inches of the leg starting at the crotch to the bottom of the leg. Would these be recommended for working in wet conditions? BEST ANSWER: These are water-repellent and feature our warmest lining. However, it depends on your needs. I used mine during the entire winter in northern Minnesota. Plowing , shoveling snow, and working outside. While I did not work in the rain, I never felt wet or soggy. Keep me good and warm even at -25 below. These are heavy and feel bulky at first, but got used to the way they move and fit and became very comfortable working in them. They are water resistant to a point. If your working in snow you will stay dry. If working in light rain you have about 30 minutes before they soak through to your under layer. They are good in cold weather but they really aren't made to keep alot of moisture out. The Yukon extreme biberalls, are they sized the same as the quilt-lined Duck bib overal? BEST ANSWER: The sizing is slightly different. Please contact us at 1 800 833 3118 for further assistance. How many ounces of insulation do you use for the extremes bibs? BEST ANSWER: This style features 10.6 oz. sq. in the body and 8 oz. sq. in the sleeves. what are the washing instructions for arctic quilt lined bibs and jacket? BEST ANSWER: The care instructions for bib style R33 is Machine wash cold with like colors - Zipped, Do not bleach, Tumble dry no heat or drip dry, Do not iron. The care instructions for the jacket style J133 is Machine wash cold with like colors, Do not bleach, Tumble dry no heat or drip dry, Do not iron. Why don't you offer these in the brown duck material? Are these insulated in the top part too or just the below the waist part? BEST ANSWER: These are insulated to the top. My waist is 34 and my inseam is 30, which size would fit best? BEST ANSWER: You would probably need size 34x30. Confused!!!! about what waist size to order I have pants that are 44 but my large stomach (not my chest) measures 51 inches around. Please can any one help before I order? BEST ANSWER: The largest size this comes in would be a 50. This may actually fit since these are sized a bit generously. Does this style have a chest zipper ? BEST ANSWER: Yes, there is a zipper on the front at the chest. I have a 51" chest and a 45" waist what size would you recommend? BEST ANSWER: We would recommend ordering a 52. Im looking for a artic extreme size 56 32 do yoy make them? BEST ANSWER: We apologize, this style is only offered in sizes up to 50.
zippers in front are they double zippers for men going to bathroom?